'Peaceful' bonobos have been observed hunting: they may corner and feast on a still-living duiker, tearing out and eating its guts even as the animal is still screaming. 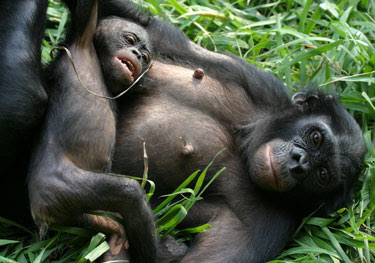 (See Loving bonobos have a carnivorous dark side). But predation and aggression are distinct behaviours, says Frans de Waal: there are, for example, aggressive herbivores such as bison and sociable carnivores such as lionesses. "For me, this finding does very little to change the idea of bonobos as relatively peaceful primates."